Canares Ultra-Mini V series, totally flexible Micro Coax offers reduced overall jacket OD and is specifically designed for short run RGB fan-out cables where robust pulling strength and high bandwidth is not a key factor. Great for shorter run Component Analog Video, Video Walls, Video Projectors, Studio Tie Lines and CG Workstations. 75-ohm Micro Coaxial Video Cable - 31 AWG. Number of Channels: 3, Red, Green, Blue. Special Jacket Fillers: Maintain tight bundle, reduces Shift and Twist. 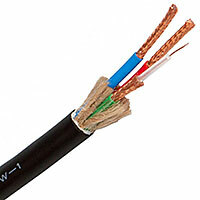 Conductors: 31 AWG Stranded Bare Copper. Conductor DC Resistance: <: 129.2 ohms/1000 ft.
Shield DC Resistance: <: 10.1 ohms/1000 ft.